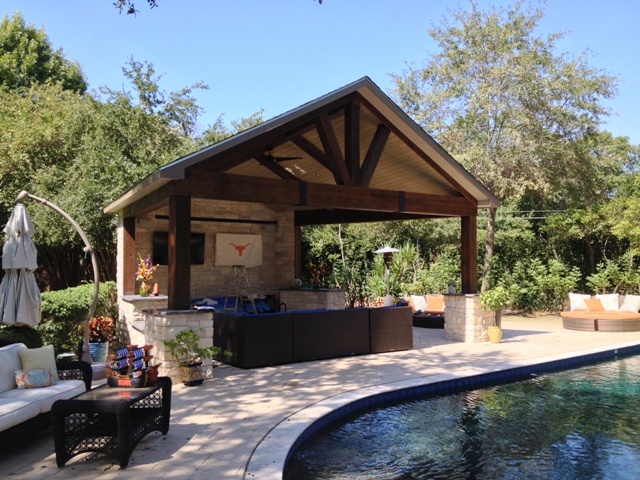 With its rustic timber frame construction and cattle skull wall art, this freestanding covered patio is an homage to Texas’ style and independent spirit. Where would Texans be without their smoking and barbecuing equipment? 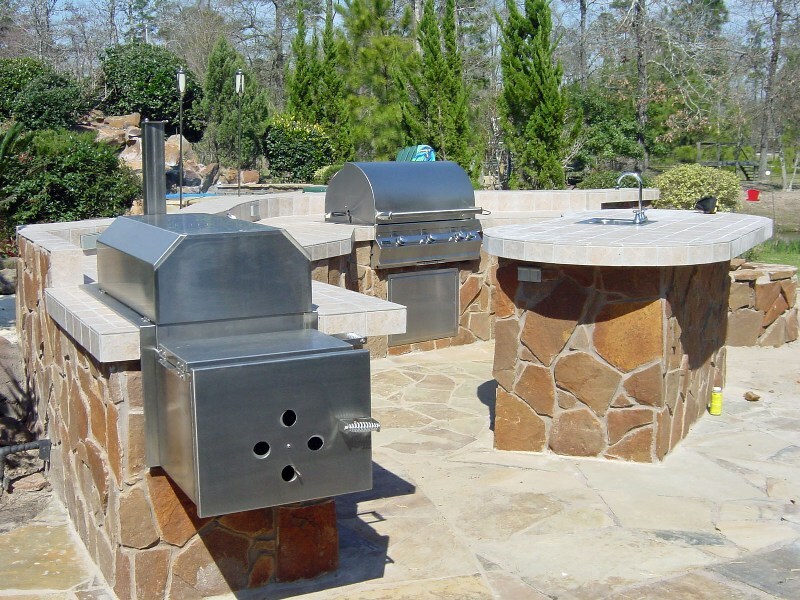 This outdoor living design features a professional-grade stainless steel outdoor smoker and grill in a built-in island of natural stone. Designer stamped concrete helps finish off the look – and the sink helps with those sticky fingers! Thinking of entertaining outside? 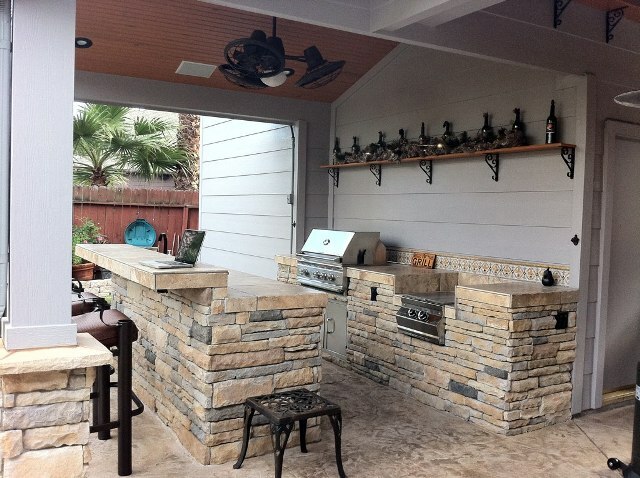 When it comes to outdoor living spaces, this place shouts “Texas!” How ’bout some Texas craft beer from a Kegerator at this wet bar, underneath a rustic, vintage-looking ceiling fan ? Above the high-end stainless steel grill and double burner is a shelf supported by Spanish Mission-esque wrought iron brackets and decorated with favorite local craft beer bottles. This outdoor, custom covered patio features the Lone Star State’s star above a built-in fireplace with a Spanish Mission-style arch. The exposed-beam ceiling and hand-hewn mantel complete the rugged look. And the name of the natural stone? Texana Light. 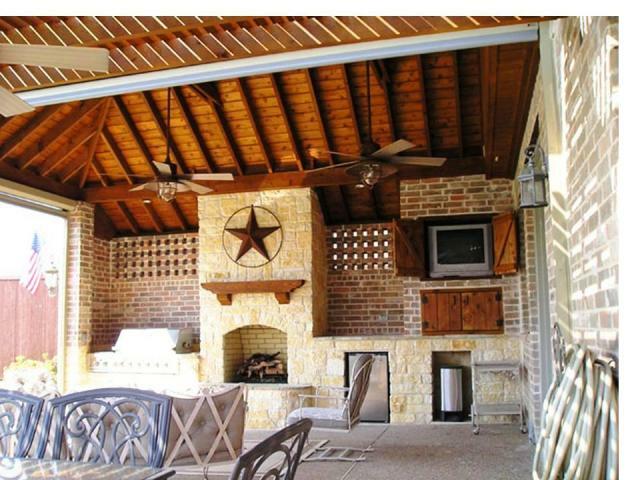 This covered patio puts the Lone Star State’s star front and center. Texas is known for supersized everything – why not outdoor living spaces? 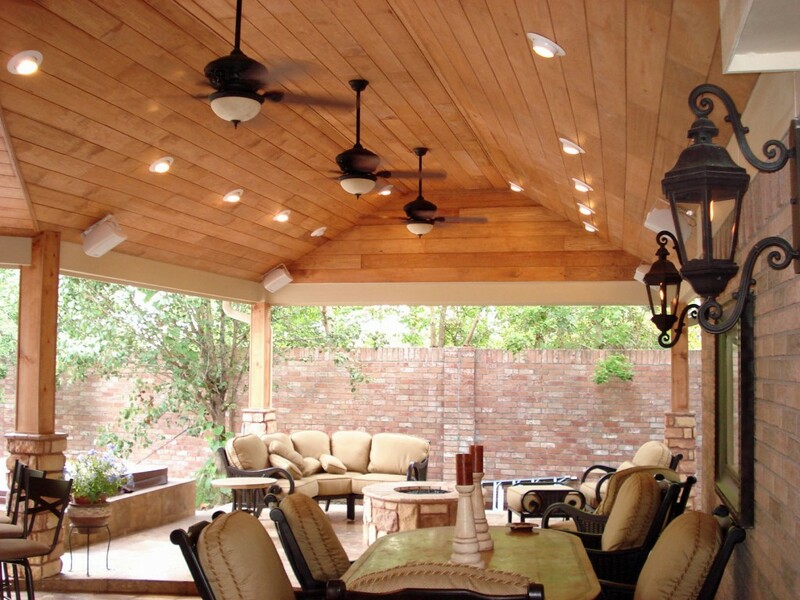 The wood ceiling shows off the interior of this covered patio with a gabled roof extension, and lends a homey foil to recessed lighting fixtures, ceiling fans and speakers. In the background is a seating area around a firepit. In the foreground is a dining table for sharing barbecue. The lanterns’ wrought iron scrolls also lend a Spanish Mission touch. So, which of these outdoor living spaces is your favorite for Go Texan Day? 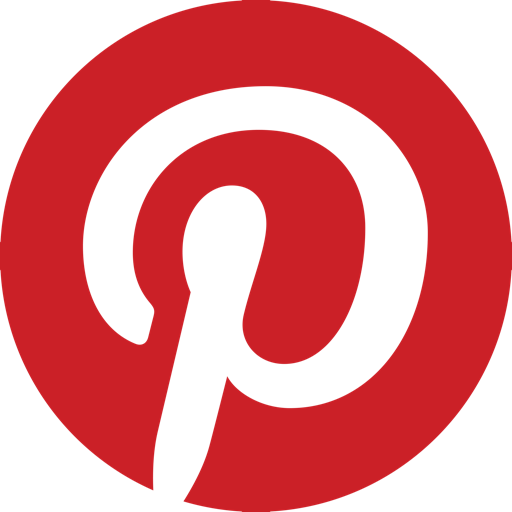 Leave a comment and tell us all about it!